What was she to choose? Duty? Or Love? After an epidemic that wiped out over half the world’s population, the next generations warred for the remaining resources until the survivors realized they needed peace in order to avoid extinction. By then the borders between the United States, Canada and Central America had disappeared and the new country was renamed Amelorica. And humanity begins to find its equilibrium within the four primary cities and the villages scattered to the west. 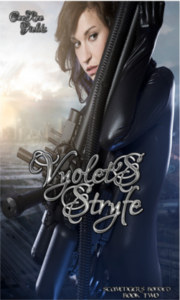 Vyolet aka Air is forced to find her sadistic cousin by a shadow organization. However, Vyolet’s no tracker, instead she’s a master thief. One who gets captured and imprisoned by the Southern Scavenger Installation. Just as she picks the lock on her prison door, all hell breaks loose. Kaarnage J’Stryfe is a Scavenger Jingoist who was saved over a decade ago. And though he was adopted by a loving family, he can’t forget the torture and degradation within the installation. So when he’s asked to help rescue others like him, he jumps in with both feet. Even though he suspected it’d be the last thing he ever did. When the installation explodes, it isn’t Stryfe’s brothers who save him. It’s a wisp of a woman he could break in half. After hearing her mission, he goes from the frying pan into the middle of an inferno. And the longer he’s around Vyolet, the deeper his feelings become. But he’s not a good bet on love. Can she convince him differently? Stryfe’s body broke out in a cold sweat as he dropped the sword and yanked open the door to his greatest nightmare. He hated enclosed spaces and these small metal boxes used for punishment felt no bigger than dog cages. A box he’d sworn long ago never to willingly climb into again. But then again most the promises he made to himself lately had been broken, so what was one more. The thick metal door clanged shut with a loud snick behind him. The sweltering heat all but stole the air from his chest and didn’t help with his slippery control. The agony and anger were unlike anything Stryfe had ever had to deal with. Normally the two feelings sung like a symphony, luring him. Taunting him. Until he crashed into the very pit of hell itself. Sometimes they were muted, twining throughout him like two lovers satisfied. But never, in the thirty years of his life, had they been at odds. The cacophony had him distracted and on edge. Jerking, his body tensed. Someone was in the prison with him. His blood-red energy twisted within him, restrained by his sheer force of will. Though it waited, like a tightly coiled snake, to escape. It wanted out to wreak havoc on anyone and anything that was near. Whether they were a threat or not. Stryfe didn’t care if his energy rushed from him, but his brothers did. And for them, he would do anything. Including reining in his volatile nature. Which probably explained the battle raging within him. He’d never forcibly contained his energy himself. His brothers had always been there to help him. On his own, he wasn’t sure how long he could keep it imprisoned. Or how long he’d have remained sane in doing it. Stryfe placed his hand on the door and prepared himself to run to another box. But dammit his internal countdown had stopped and he knew it was too late. Then he felt her. Her body briefly pressed into his as she shifted and his battle readiness relaxed a bit. Determined to pretend the woman wasn’t there he leaned his back against the door. “Oomph.” Stryfe’s breath left him as her sharp elbow jabbed him in the stomach. Placing his good hand over it so she couldn’t hit him again, he was at a loss. What was he supposed to say? He was not a people person, hell he wasn’t even much of a person’s person. Wishing the comm-weave was still active so he could ask Tyr, Stryfe tried not to throw up at the throbbing pain in his arm and focused on the quiet rasp of the woman’s breathing. But no matter how hard he struggled to distract himself, nerves began to get the better of him. Memories of being trapped for days and sometimes weeks in the darkness swum within his mind. His body broke out into shivers. He wasn’t sure if it was from blood loss, from the poison the Jingoist had injected into him or just from terror. He took a ragged breath and it was then a soothing scent surrounded him. Stilling his body, he stiffened as the smell hit him again. Like a fist to his face, he flattened himself against the door. As he tentatively sniffed the stale air inside their prison. It wasn’t the stench of fear, nor the clamminess of sweat dripping from his skin. It was subtler. Jasmine. Inhaling deeply a soothing calmness permeated him. Releasing the tension in his body and relaxing the knot of energy inside him. It was a novelty to him as he’d never met anyone who wasn’t afraid of him. Even his brothers were wary of his abilities. Then it dawned on him that she couldn’t see him yet and he sighed. His curiosity was peaked and his mind turned towards the puzzle the woman presented. Which helped him dispel the last of the horrors from his head. He tried to pierce the absolute blackness, but even with his enhanced sight he had no luck. All he could determine was he was sharing the space with a female. One that reached the middle of his chest if he was standing up straight and not crammed into the equivalent of a klasfish can. Lush curves pressed into the planes of his body and annoyance seemed to be the overlaying smell if he had to choose one of the emotions she was transmitting. Then the woman huffed as if she were frustrated. Stryfe smiled. It felt strange. He rarely felt amusement or many of the positive emotions. He’d been conditioned to block all emotions but rage by his trainers. Scavengers weren’t supposed to have feelings, especially Jingoists. His sect were to be robots. Reaction in battle situations were acceptable, but otherwise nothing else was allowed to interfere with his objectives. But then again, Stryfe had never been a model Jingoist, at least in that respect, because he did feel sometimes. He felt protective of his adopted brothers, which now encompassed Ketewah, their new village. He cared what happened to his adopted mother and sisters. And he now felt curiosity and something else. Something undefined. She pulled from him emotions he’d never had before, or if he had them they were long buried in a past so riddled with pain he didn’t want to remember them. His gut told him if he stayed with this woman, then she would pull them all from him and that had him back on the knife’s edge of panic. For him panic was not a good thing. Panic usually followed with a body count.